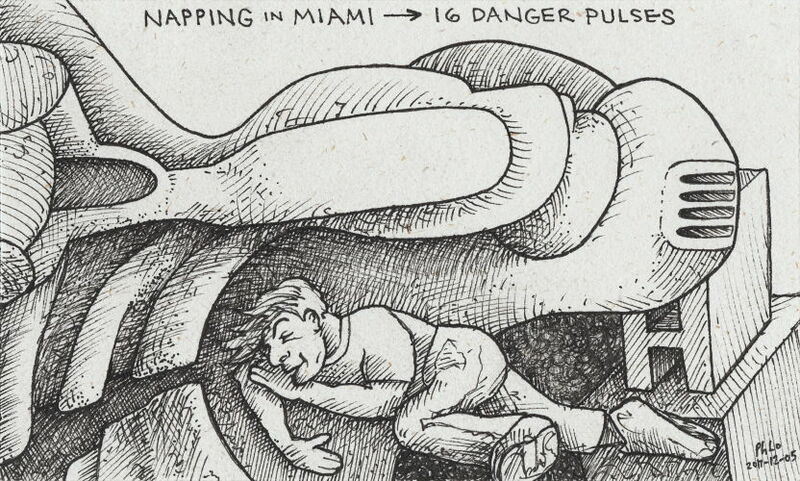 Within relative proximity to the Bermuda Triangle, strange things happen in Miami when homeless youth take naps near this particular storm drain. Heat activated draperies take flight. Gravity isn't even a factor anymore. No one goes near those streets at night because while others can see it unfold from a distance, up close hopes and dreams are wrapped in the curtains of rottweiler efficiency. The sixteen dangers are actually only two, but someone looped them through a function that doubled the integer input each iteration until the larger number resulted. The loop might have continued except CGA monitors can only handle 16 colors at one time. Overloading the circuits is nigh as dangerous as the Bermuda Triangle itself. Tonight I had absolutely nothing in mind to draw. Oftentimes I draw random curves to get started. Usually some kind of structure or creature pops out of the lines later on. A creative title didn't come to me either, as I feel rather dull today. After the fact (not before), a couple Scripture verses come to mind as I glance at the drawing from different angles. Psalm 91. The drapery creature seems to be protecting the homeless man rather than posing a threat. And since it has wing-like structures it reminded me of this passage. The second passage that comes to mind is Luke 16:19-31 because there also appear to be ribs in the folds. Therefore Abraham's bosom comes to mind. I have no idea what that phrase means, but maybe that's where this man naps safely in spite of 16 danger pulses. Could this be Lazarus? I think so. Rottweilers came up in conversation earlier, and it's possible they are the very dogs to lick the poor man's wounds. This is hardly an illustration of those verses, but I couldn't help but mention the connection my weird synapses picked up on. It's also quite possible that Lazarus practices Wing Chun kung fu in his sleep, as his arm positions closely resemble bong sao (wing arm).